The custard base is traditionally flavored with vanilla, but is also sometimes flavored with lemon or orange (zest), rosemary, chocolate, coffee, liqueurs, green tea, pistachio, coconut, or other fruit. The earliest known reference of crème brûlée as we know it today appears in François Massialot’s 1691 cookbook, and the French name was used in the English translation of this book, but the 1731 edition of Massialot’s Cuisinier roial et bourgeois changed the name of the same recipe from “crème brûlée” to “crème anglaise”. In Britain, a version of crème brûlée (known locally as ‘Trinity Cream’ or ‘Cambridge burnt cream’) was introduced at Trinity College, Cambridge in 1879 with the college arms “impressed on top of the cream with a branding iron”. The story goes that the recipe was from an Aberdeenshire country house and was offered by an undergraduate to the college cook, who turned it down. In Catalan language; Crema catalana (‘Catalan cream’), crema cremada (‘Burnt cream’) or crema de Sant Josep, is a Catalan dish similar to crème brûlée. It is traditionally served on Saint Joseph’s Day, March 19, although nowadays it is consumed at all times of year. The custard is flavored with lemon or orange zest, and cinnamon. The sugar in crema catalana is traditionally caramelized under an iron broiler or with a specially made iron, not with a flame. Crème brûlée is usually served in individual ramekins. Discs of caramel may be prepared separately and put on top just before serving, or the caramel may be formed directly on top of the custard, immediately before serving. 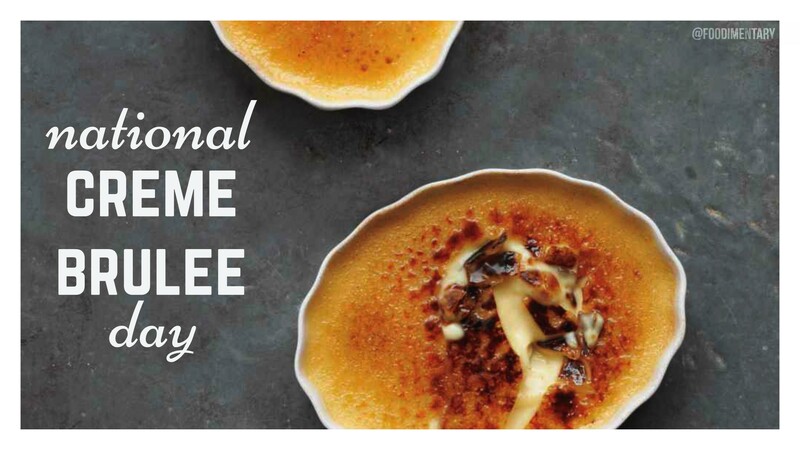 To do this, sugar is sprinkled onto the custard, then caramelized under a broiler/salamander, with a butane torch (or similar), or by flambéing a hard liquor on it. 1694 Georg Brandt was born. A Swedish chemist, he discovered the element cobalt in 1730. Cobalt is used in steel making, and is an essential part of vitamin B12. 1873 It rained ants in Nancy, France. 1988 An Indian Airlines Boeing 737 was charged by a bull while landing at Baroda Airport in western India. The bull lost. 1994 A smoking ban in restaurants and bars in Maryland began today. Reblogged this on One Black T-Shirt.